Seth God­in at Gel 2006 from Gel Con­fer­ence on Vimeo. Seth presents a long list of reas­ons why things are broken or merely poorly designed. Some broken things may be fixed, oth­ers not. It is as always very enter­tain­ing and reward­ing to listen to Seth, but I espe­cially like his dis­cus­sion on things broken by pur­pose. 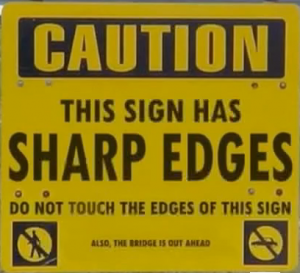 It may be wise to real­ise that some stu­pid signs maybe were designed to grab your atten­tion.